This article is an update to our previous report “The WormHole Vulnerability: The Number of Affected Apps is Increasing”. We will introduce more technical details about this vulnerability going forward. The Moplus SDK creates a local server for in- and cross- app communications. It links on special ports (6259 or 40310), but doesn’t need to match the request source correctly. It only checks the Host/remote-addr/Referer field of the arrived packet. If their specifications align, it will allow their connection and accept/execute many powerful commands in the url’s parameters, such as downloading files from the internet, installing Apps, running apps, uploading user’s phone information, etc. 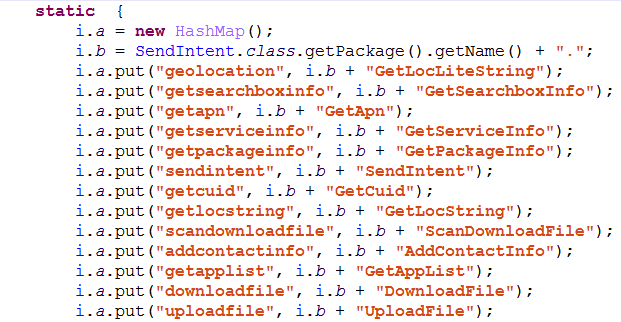 These packet headers can be easily forged, allowing an attacker to send specially made urls to the user’s phone remotely, and executing dangerous commands on the user’s phone. Moplus SDK is so useful that many third party apps contain Moplus SDK for search engine or map services. Therefore, this vulnerability can have a large impact on Android users. You only need to know the user’s ip to launch an attack. Yes, that’s all. Then it will consider that this request is from inside the app, accept it, and execute the command contained in the request. 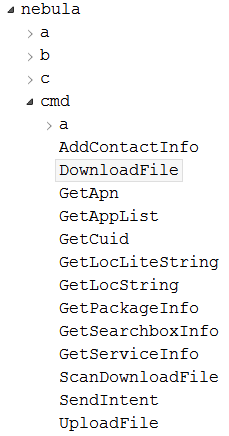 All commands that the Moplus SDK supports can be seen in the function com.baidu.android.nebula.cmd.i. For example,take the command “downloadfile”. 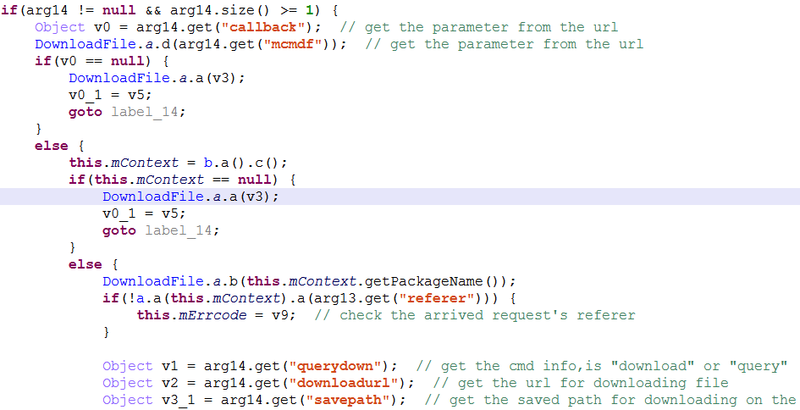 Its code is as follows: The function gets the download url, the saved path, and the file size (in bytes) from the url. Then it will download the file to the user’s phone, and the file will be saved in the “savepath” directory under the sdcard directory, etc. in /sdcard/$savepath$. Another important command is “sendintent”. Anyone could specify the intent Uri, which will start the Uri intent directly, such as dialing the specified number, sending an sms, or running an application. We developed the exploit application in Python and Java several days ago and tested it successfully, but recently Baidu updated its SDK. The vulnerable port (6259/40310) has been closed (I have tried several Apps, with the same outcome). When the app containing Moplus SDK is newly installed, the 6259/40310 port will open for several seconds, but will close soon thereafter. So now the exploit cannot be used. When executed, it will return an error. 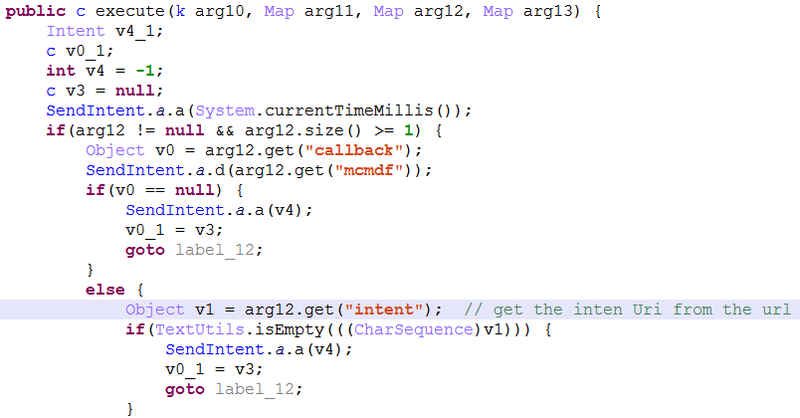 However, we found another vulnerability: the 7777 port is always open, so by exploiting the same vulnerability, the attacker could get useful information of the phone remotely, such as the phone’s IMEI and the user’s location, but cannot execute dangerous actions such as installing apps or downloading files to the user’s phone. Regardless, this could still result in the leakage of the user’s private information. These commands are so powerful, like Doraemon’s key, and this SDK so widely used, especially in China. 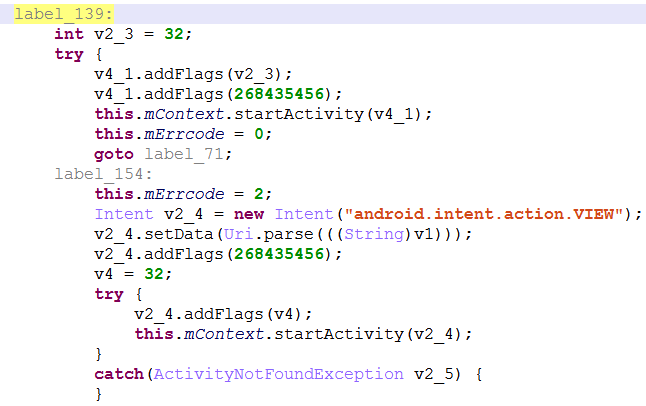 If used by attackers, this could have a widespread negative impact for Android users. Imagine if you use a 2G or 3G network. All users are on the same LAN, so the attacker can just scan the net range then see if you opened the 6259/40310 port. If yes, then the attacker could launch the attack. It’s that easy. So big companies should pay more attention their SDK and app security, and protect the Android world for users. Remember: With great power, comes great responsibility.